A larger icicle? A LARGER icicle? You don’t think 10 feet across, 5 feet long and 10 inches thick is a LARGE icicle? Boy, I’m never coming to Norway. I hate to see what you call a LARGE icicle. Thanks. Even though you said at the beginning it was 10 feet across, I’d always had this image of an ice-cream cone that was ten feet high. Maybe it was more of a food daydream than an icicle nightmare. By “a 10-foot icicle” I imagined one 10 feet long, not wide. That would indeed be a huge one. I have certainly seen 5-foot long icicles on some houses, a danger to passers-by. 10 inches thick sounds like a real monster. Interesting how the icicles on these buildings gather at the corners – where the stone is never warmed by the heat inside the building. It’s the middle one that worries the housing guys. They’re afraid it will pull down part of the ledge or the drain pipe when it crashes down. I adore the alpinists who rapel down the buildings to knock them off. Wouldn’t you love to see their business cards? 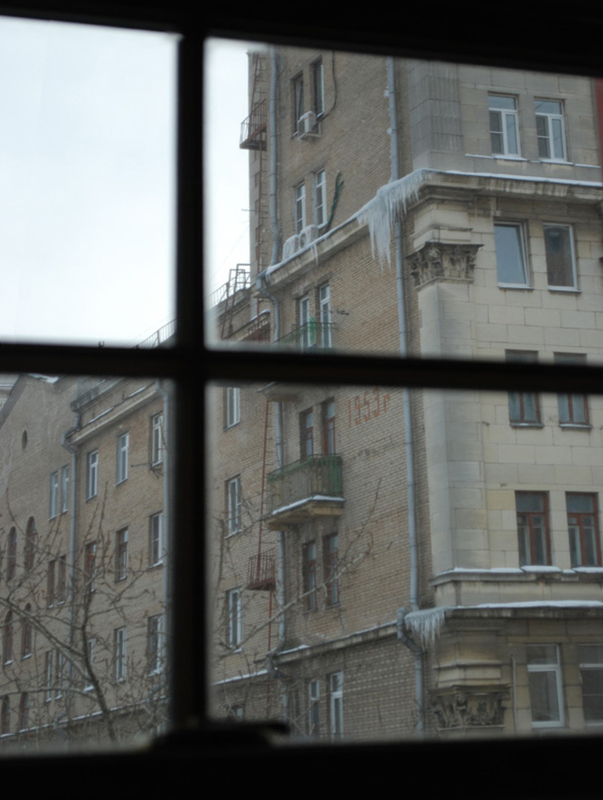 In the summer they climb mountains; in the winter they climb down Moscow’s high rises. 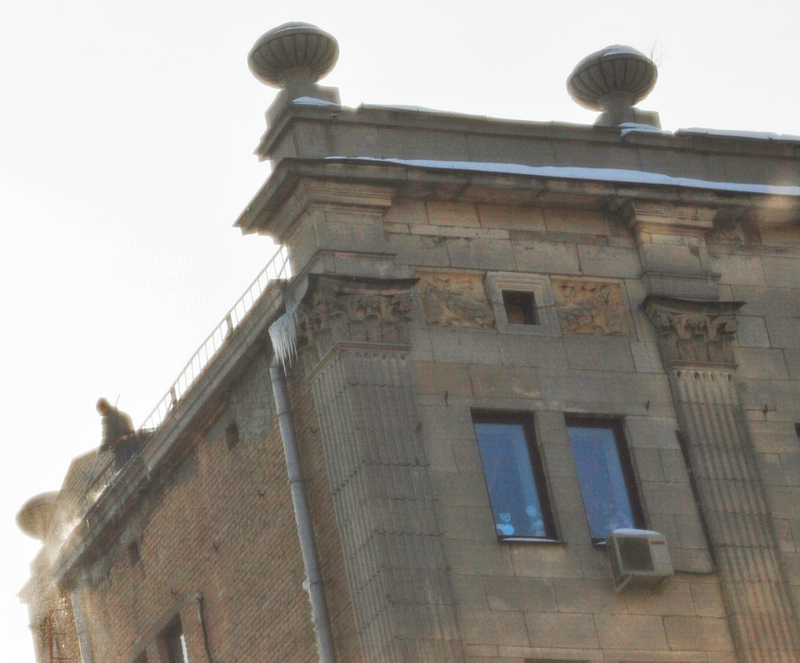 It says “1953″ in the brickwork, the year I was born and Stalin died. AJP, you don’t have to worry. Reincarnation is not always immediate, as with the Dalai Lama. There can be a lot of time between the reincarnations of ordinary people. I have to fight a compulsion to grow a walrus moustache, so he’s right–unless I got it from Nietzsche. Sili, I’m puzzled by the juxtoposition of reincarnation and Eastern Orthodoxy. More anent slipperiness – another childhood word has returned: “slape”. I knew one family who used it and they were fishermen. Our fisherfolk had come from Cumberland a few generations before, so it may be classed as Northern English rather than Scots, if it’s known to scholarship at all. I used to help them build boats – and went to sea with them too (ho yuss, I’ve taken the helm on a trawler, I have) – and they would occasionally instruct me to make something “slape” i.e. slippy, slippery. Some surfaces don’t need much action to become slape; a smirr of rain would do it. I hope that helps with The Icicles Question. 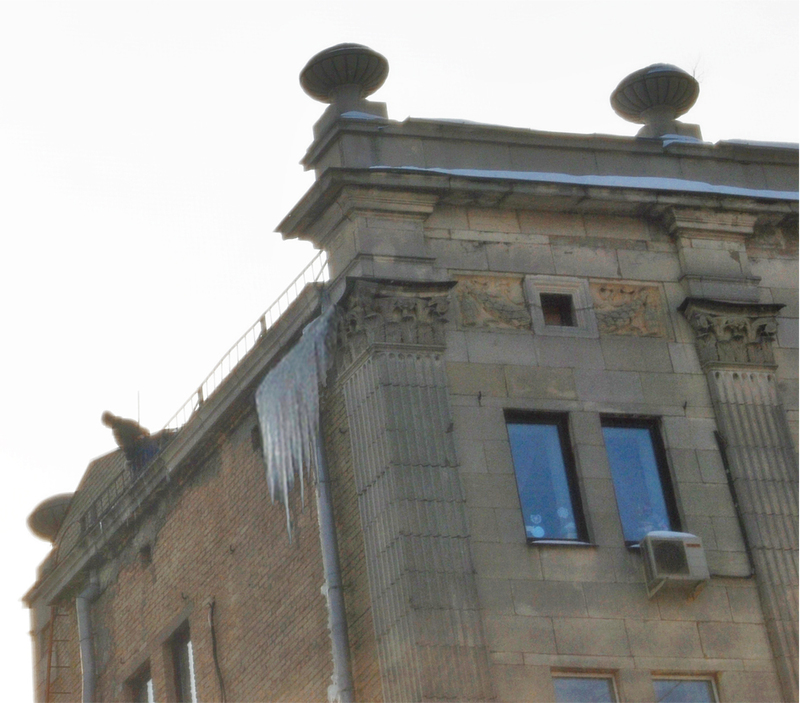 If today in Moscow you have ice sickles, do you have ice hammers as well, or were they really too heavy? Sorokin’s Ice “tells the story of a group of people in present-day Moscow who spend their time kidnapping people with blond hair and blue eyes. They take them to secluded areas and pound them in the chest repeatedly with a hammer made of ice.” So that’s what you do with an ice hammer. “slape” or actually sleip is the Norwegian for slippery. I don’t know what the number is for, but no way that building is from 1953. I’d say the last decades of the 19th century – judging by the style in general and the original windows and doors in special. So apparently it’s originated as an adjective formed to a causative of ‘slepe’ “hawl”. Yes, exactly, you’re judging by the style. It could easily be pre-war in New york, so it doesn’t surprise me that it’s ten years older than that in Moscow. You’re labouring under the modernist illusion that modernism is somehow inevitable, which it isn’t. 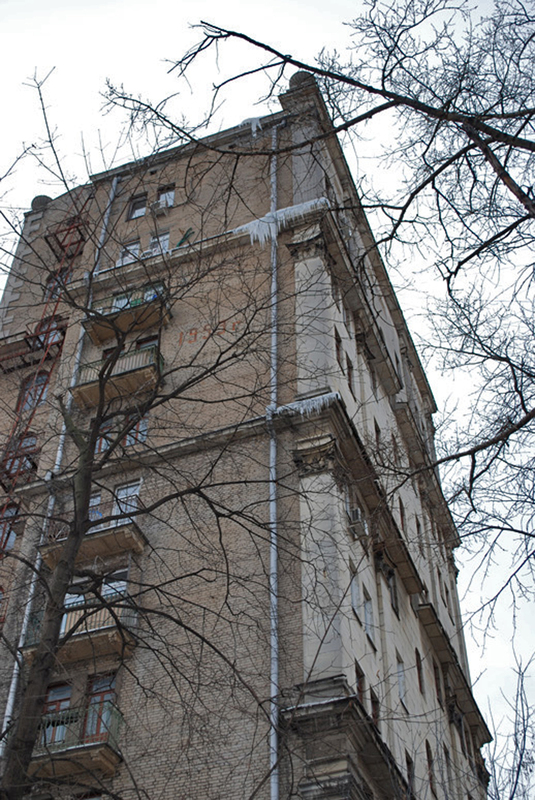 I’ll have to take a photo of the front of the building (the icicle side is the courtyard side), and you’ll see that it’s classic Stalinist style. At the turn of the century they were building magnificent style moderne (more or less art nouveau) buildings in Moscow. Then there were a few constructivist wonders, and then the Stalinist style. A fun fact: the 7 Stalinist skyscrapers were in part based on US architecture, like the Chrysler building. My building was originally built in 1939, but redone and built up to match the tower building in 1955. The wiring, windows and pipes hadn’t been changed in 55 years. Big mess. (I spent the last year renovating the apartment, and I’m never, ever, ever going to do that again. ) 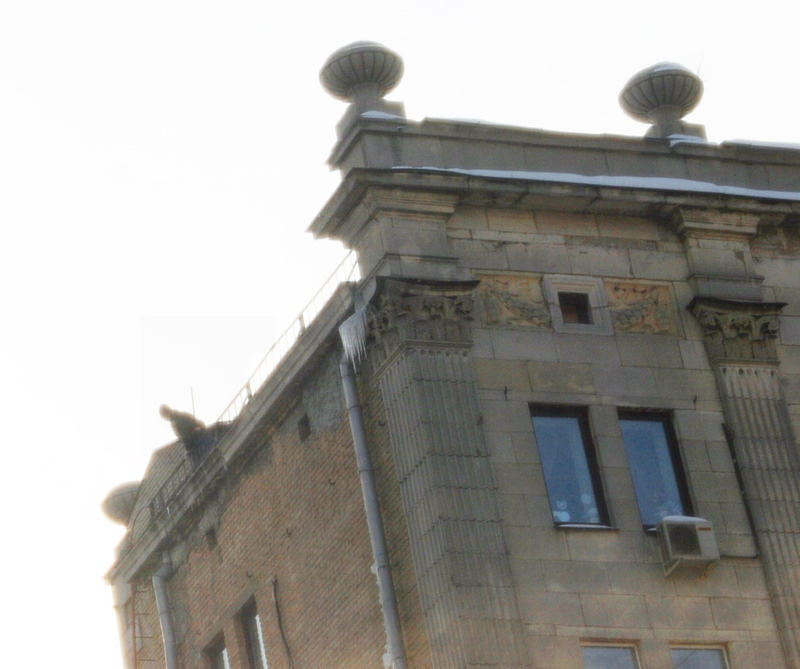 In the photo, the white windows are new (plastic); the reddish brown ones are the old ones. Ice sicles and hammers made me laugh. But the huge chunks of ice from the roof that I negotiate every time I go outside do not make me laugh. Scary. I give up. “1928. Heavy, late Jugend before turning Art Deco, like in Helsinki”, says my wife. The three of you together is more than I can handle. In the photo, the white windows are new (plastic); the reddish brown ones are the old ones. At least I got that right. Relative, not absolute age, anyway. But it’s still a surprise. I’ve always believed that tall T-windows like that pinpoint the age of a building to close to the turn of the century, just before the introduction of Jugend/Art Noveau. In Norway, that is. But I imagined it to be style ruled by technology and thus international, and with Moscow perhaps a few years before Oslo. I’ve even talked my wife into agreeing with me on that. Another fisherman term was “each”, being the tool usually called the adze. Is “each” of Norse origin too? DSL – SND1 EETCH, n. Also each, †eech, eatch(e), e(i)tch, edge. [itʃ Sc., but Uls. + ɛdʃ] 1. An adze (w.Sc. 1741 A. M’Donald Galick Vocab. 49, eech; Gall. 1824 MacTaggart Gallov. Encycl. 194, eetch; Sc. 1825 Jam.2; Uls. 1880 Patterson Gl. Ant. and Dwn., edge). Gen.Sc. Calvin’s sons speech is Jove’s sons eetch, Wisdom to teach and prune each beech. Let me hae a whample at him wi’ mine eatche — that’s a’. He wis a boat’s-bigger till his trade, an’ ae nicht he wis gaein’ hame frae his wark wi’ his fit eitch apon his shouder. He can handle an etch or a hammer, A chisel, a plane, or a saw. Aeneas, my lad, take you the eitch and work it like a wright if feet come down that ladder. It wid gie ye a bit o’ a begeck, but nae sae ull as ta fin’ a lad ahin’ yer cheer wi’ a new eetch in’s han’. 2. A kind of hoe; a mattock (Ork.5 1948). The ground was well broken up with eatches, which were like big hoes, and were made at the smithy. The hacking with eatches, I am informed, was endless. The principal cultivator was the eatch, which was made in the style of a hoe, but much heavier, and with a deeper blade. It was used to fill backs with instead of ploughing them in. Mab: Ice sicles and hammers made me laugh. I tended to write it “sicle” as well, but apparently it has a k-, just like Mr K.
Norway acquired architectural styles almost randomly. There’s no rococo here, for example. The nuances that you can compare in, say, nineteenth-century housing in London, New York and Paris just don’t exist. It was a poor country with a tiny population. The styles that did make it here came decades– centuries, even–after they were current elsewhere and they’re often not very good examples (sorry, that’s just my opinion). So it’s a bad place to use as a standard. But I imagined it to be style ruled by technology and thus international, and with Moscow perhaps a few years before Oslo. Style was never ruled by technology. That’s a modernist myth. Stalin wiped out modern architecture in the Soviet Union in 1930-31 (see the Palace of the Soviets Competition). It’s one of the minor tragedies of the 20th century, because even during the short time that they were going the constructivists (especially Melnikov) put up some buildings that were subsequently very influential in the west. After 1931 the only significant thing Melnikov was allowed to build was his own house. It’s one of the ironies of post-Soviet Russia that this building, which is nominally protected, is probably soon going to accidently-on-purpose catch fire and then be bulldozed so that the site can be used for greater financial advantage by developers. But the huge chunks of ice from the roof that I negotiate every time I go outside do not make me laugh. Scary. You’re right. The snow from half of the roof slid off our house yesterday, making it shudder. The bottom layer was ten-centimetres-thick ice that’s now scattered in large chunks on the ground. If anyone had been outside they would have been killed, first by the chunks of ice and then again by being smothered in the avalanche. Roadworks tailbacks can cause road rage.